Centrally located Broadbeach is one of the best destinations for a family holiday on the whole of the Gold Coast. With so many great theme parks, family attractions, restaurants and beautiful sandy beaches within easy reach of our Broadbeach resort apartments, you will have no trouble keeping the whole family entertained when you book your stay at Aruba Beach Resort. Our spacious and comfortable Broadbeach apartment accommodation has an AAA rating of 3.5 stars. The resort boasts a range of facilities designed to make your holiday as comfortable and fun filled as possible. Start your day with a few lengths of our outdoor swimming pool, enjoy a barbecue with the family for lunch and take a stroll along the beach in the afternoon before unwinding with a long soak in our heated sauna as evening draws in. If you still have energy to burn, head to our onsite gym! Want to catch up with friends and family back home? Take advantage of the free wireless broadband internet access at our Broadbeach resort apartments. If you have any problems or questions during your stay, just speak to the onsite manager at our Gold Coast holiday apartments, who will be happy to help. For advice about local attractions, brochures and assistance with tour bookings, ask our friendly reception staff. 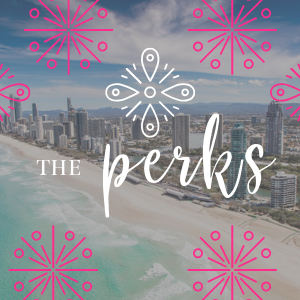 There is a reliable local bus service that runs from almost outside the door of our Broadbeach resort apartments, so let someone else do the hard work and get out and explore all that Broadbeach has to offer.